Elan Daley began competing in the 2019 Central Region A Championships in Canada. Daley would finish with the fastest Girls 13 Year Olds 200 Long Course Meter Freestyle Preliminary time touching the wall in a time of 2:07.16. In the Girls 13 Year Olds 200 Long Course Meter Freestyle A Final Daley would win the Gold Medal with a time of 2:07.71. 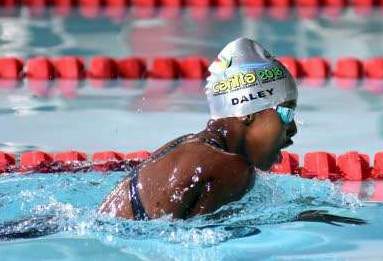 Daley’s time in the Preliminaries broke her record of 2:10.26, set back on XXXIII Carifta Swimming Championships in Kingston, Jamaica. Daley would also record the fastest Girls 13 Year Olds 50 Long Course Meter Freestyle Preliminary time with a time of 26.85. Daley would go on to win the Girls 13 Year Olds 50 LC Meter Freestyle A Final touching the wall in a time of 26.41. Daley would break the record of 26.59 she set back on April 3rd, 2018 during the XXXIII Carifta Swimming Championships in Kingston, Jamaica.